Category wise list of all the Qualified Candidates - BCA, BCB & SC Cat. Following are the revised answer key after verification in respect of Written Screening Test held on 27.01.2019 for the various group C posts advertised vide advertisement No. 7/2018. Result of Entrance Test held on 20 Jan. 2019 for admission to M.Phil in Psychiatric Social Work Course. RESULT OF ENTRANCE TEST HELD ON 20.01.2019 FOR ADMISSION TO M. PHIL IN PSYCHIATRIC SOCIAL WORK COURSE. Corrigendum- against Advt No 08/2018 for post of teachers - The closing Date has been extended uptill 14/12/2018 5pm. 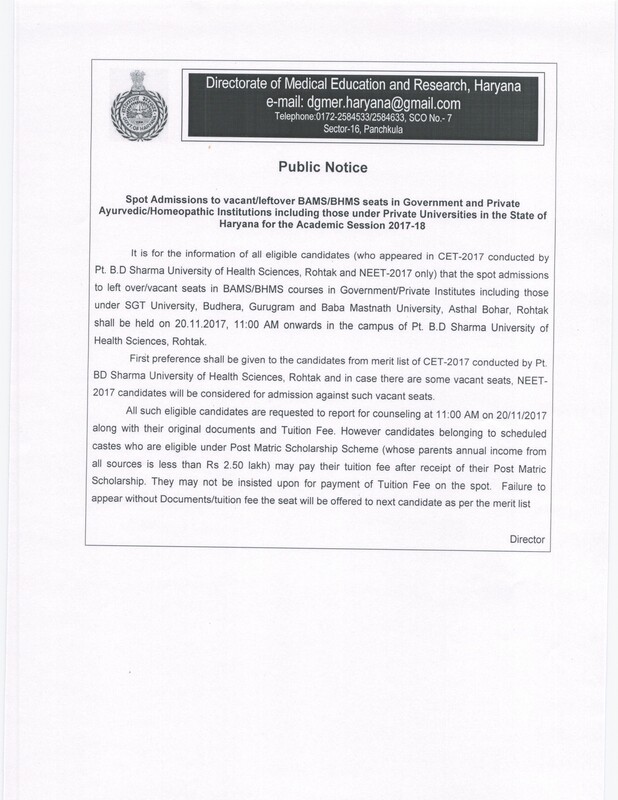 Notification - Walk in round of Admission to fill up vacant/left seats of BDS in Dental Colleges in the State of Haryana for the Academic Session 2018-19. Public Notice - Admissions to left over/vacant seats in BDS Course in Govt./ Private Unaided Dental Institutions including those under SGT University, Budhera, Gurugram ( Private University) in the State for the Academic Session 2018-19. College of Pharmacy: PGIMS: Pt. BDS University of Health Sciences, Rohtak. 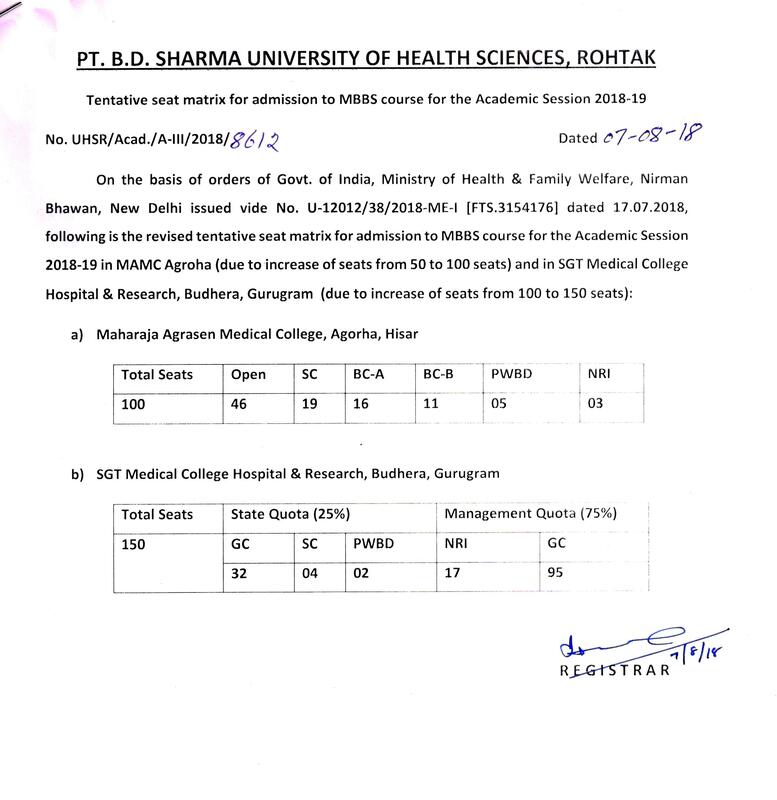 On the basis of common merit list, mop-up round of counseling for admission to three vacant seats of B. Pharm. Part-I shall be conducted on 15.08.2018. Admission shall be made strictly in order of merit obtained in entrance examination provided that the candidate is otherwise qualified as per prospectus. Those who do not report on time shall not be considered for admission. Mere reporting does not confirm admission of a candidate. Notification - Regarding Admission to BAMS/BHMS Courses in Govt./Private Ayurvedic/ Homeopathic Colleges for the Session 2018-19. Notice, in response to Walk-in-interview held on 23.06.2018 instead of 21.06.2018, for the post of Senior Resident in various Deptt. of PGIMS, Rohtak. 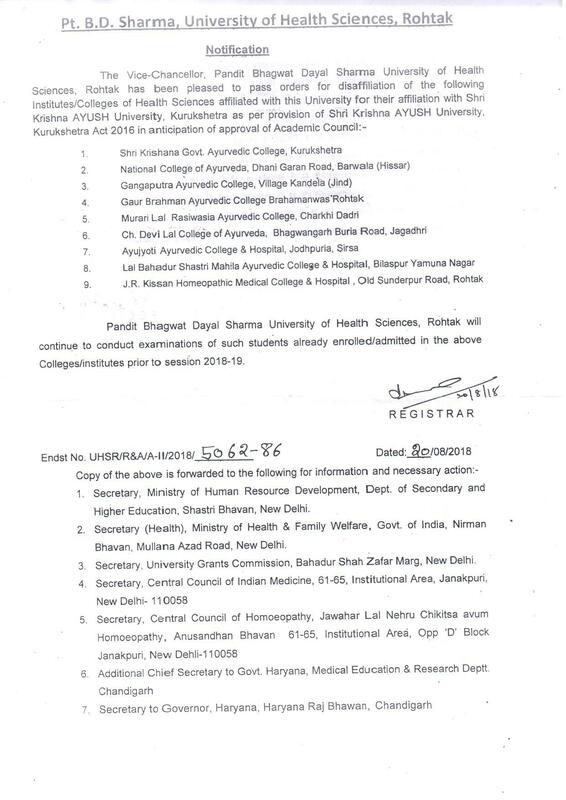 The List of candidate provisionally selected for short Term Clinical Assistantship is Postgraduate Institute of Dental Sciences, Rohtak, interview held on 11.04.2018. 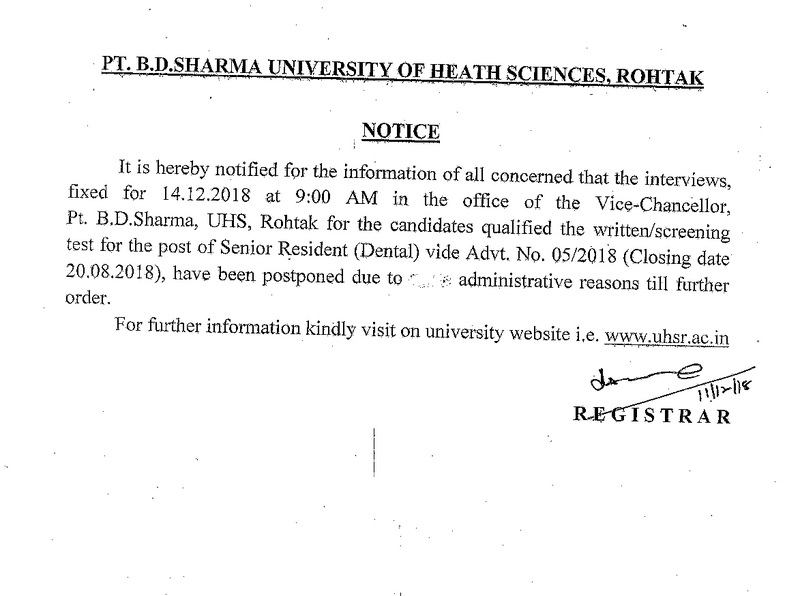 NOTICE The last date for submission of application form for Short Term Clinical Assistantship for session 2018 in Postgraduate Institute of Dental Sciences, Rohtak is hereby extended uptp 09.04.2018 upto 5:00 pm and interview for the said assistantship will be held on 11.04.2018 at 11:00 am at the same venue. The last date for submission of application form for Short Term Clinical Assistantship for session 2018 in Postgraduate Institute of Dental Sciences, Rohtak is hereby extended uptp 09.04.2018 upto 5:00 pm and interview for the said assistantship will be held on 11.04.2018 at 11:00 am at the same venue. Minutes of meeting held under the chairmanship of the Vice-Chancellor on 20-11-17 at 12.00 Noon in Swarna Jayanti Sabhagar of Vice-Chancellor Secretariat to discuss various recommendations made by NAAC Peer Team for quality enhancement of the University. List of candidates who have been allotted seats provisionally during the counseling held on 03.01.2018 for admission to Dental Hygienist/ Dental Mechanic Diploma Course for the session 2017-18. That the implant policy already approved by the Government of Haryana vide letter Memo No. 21/55/2015-2HB-II dated 20.10.2016 will be implemented in the PGIDS, Rohtak. The firms are requested to provide their rates for the impants including prosthetic components. Above mentioned candidates are directed to report to the office of Principal, PGIDS Rohtak within 02 days positively. 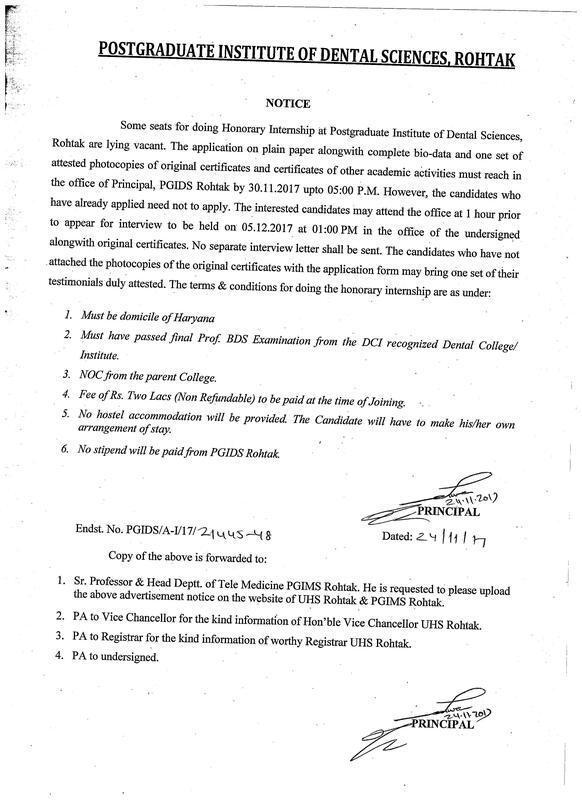 In continuation to advertisement dated 16.11.2017 regarding admission to Dental Hygienist/Dental Mechanic Course for session 2017 in Postgraduate Institute of Dental Sciences, Rohtak. Advertisement for the post of Asstt. Prof./GDMO (on rugular basis) and SR/Demonstrator-Dental (on tenure basis). List of Appointments quashed / withheld as directed by Hon’ble Punjab and Haryana High Court order on CWP No 19089 titled Mahipal and ors Vs. State of Haryana & Others. Amendment in Clause 29 (ii) 2 and Note – VIII of the Ordinance regarding conditions of affiliation of colleges and Institutions to the Privileges of the University and the withdrawal of such privileges.